If your skin is anything like mine, you need FULL moisture, especially to battle these cold, winter, dry months. And if you work in an office with no fresh air, your symptoms may also be magnified. Here are some of my favorite beauty products that help to make the winter months more… bearable, I should say. 1. Caudalie’s Beauty Elixer: This fantastic serum can be used anytime (which is the best part about it!). Under makeup, over makeup, as a pick me up, nighttime relaxer. You name it! It’s a mist-serum that containes essential oils that help keep skin smooth, moisturized, and toned. Not to mention it’s refreshing cooling feel and great smell! 2. L’Occitane’s Shea Butter Hand Cream: This amazing thick moisturizer is perfect to keep your hands well hydrated. The shea butter is infused with honey, almond and coconut oil for the perfect combination. Plus this travel size is great to keep in your purse or at your desk at work. 3. Aveeno’s Intense Relief Overnight Cream: Don’t be fooled by the “overnight” part. This cream is an essential and I use it during the day as well. The colloidal oatmeal and shea butter help with any sort of itching, plus provides full moisture. I apply this right out of the shower and though it is thick, it sinks into the skin fairly quickly and leaves no oily residue. 4. Egyptian Magic: This fabulous balm is made with mostly olive oil, bee pollen, beeswax, honey, and bee propolis. Don’t worry about the slightly funny smell, the results are amazing. It’s called a cream, but looks more like a balm. You only need to apply a little bit to your hand and work it to make it warm and more “spreadable,” then apply to dry spots, cuts, face, elbows, anywhere that need some “love.” I much prefer this to Aquaphor, which I feel is sticky and greasy. 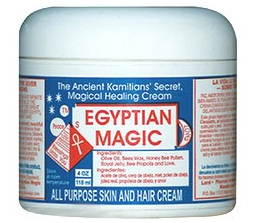 Egyptian Magic is quickly absorbed into the skin for maximum relief. 5. Origins Soothing Lip Balm: This thick lip balm isn’t like others that need to be reapplied constantly. If you’re like me, my skin doesnt feel good if my lips are dry, cracked and flaky. Made with 97% organic ingredients, this lip balm has shea and cocoa butter, palm, coconut, safflower and vanilla oils. Because of it’s organic nature, it’s not as smooth going on as most lip balms, but it’s well worth it. Quite pricey for a lip balm ($15), so save this one for emergencies only! Got an amazing product that I forgot to mention? Leave it in the comments or email me! If you’re an organic, all-natural makeup junkie like me, or just want something that won’t irritate your skin, then look no further. Korres‘ beauty products are all natural and they are among the most environmentally friendly and skin compatible products available on the beauty market these days. It’s nice to know that some companies actually care about what you put on your face! They have all natural extracts with antioxidants that are proven to transform your skin. Don’t believe me? Try it yourself. All their stuff is available at Sephora. Monoi Oil Bronzing Powder: I LOVE LOVE LOVE this product. Not only does it lightly hydrate your skin so it doesn’t appear all flaky and dry, it provides a light shimmer to give you that sunkissed glow. Pomegranate Cleaning and Makeup Removing Pads: How convenient are these makeup removers? It makes taking off makeup so easy and fun. Not to mention they offer antioxidant protection and smell delicious! Wild Rose Foundation: This foundation is light, provides a dewy look yet gives the coverage that you need. The best part about it is that is has SPF 20 so you don’t need to be thinking about putting on sunscreen. It also has your daily dose of Vitamin C!